(CNN) - Border Patrol agents arrested 16,658 family members in September, marking the highest such total for any month, The Washington Post has reported. The Post report cited unpublished numbers from the Department of Homeland Security, which is tasked with enforcement of immigration laws and border security. The report said the September total was an 80% increase since July and that the number of migrant parents entering the US with children had reached record levels over the past three months. The report noted, however, that while the overall total number of arrests along the US-Mexico border -- at 396,579 people -- was higher relative to last year, the total was nowhere near highs seen in the early 2000s. The spike in family crossings has followed Trump's move in June to reverse his administration's policy that led to family separations. 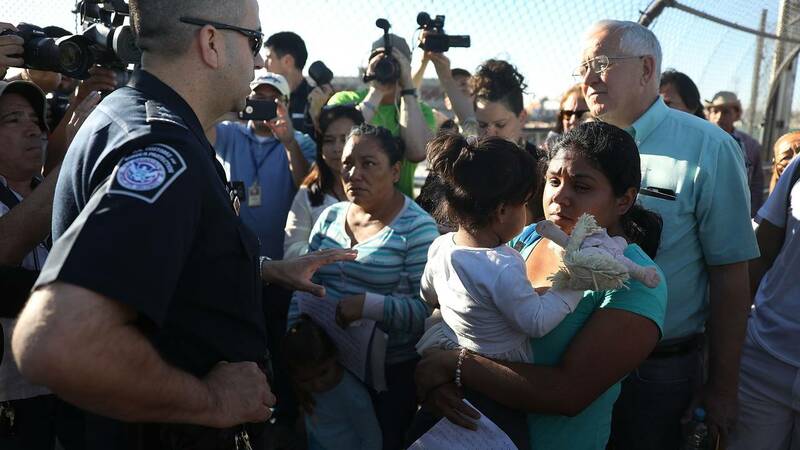 The widely criticized separations themselves followed an uptick in statistics for border crossings, and the new report on the surge in families entering the US comes just weeks before the midterm elections, which Trump has tried to make in part a referendum on immigration. Trump said in a recent interview that the administration was "looking at a lot of things" in regard to immigration and declined to give a straight answer on whether he planned to renew family separations. "When you allow the parents to stay together, OK, when you allow that, then what happens is people are gonna pour into our country," Trump said. The latest numbers from the Post were in line with what a senior Customs and Border Patrol official told CNN last Friday. Manuel Padilla, chief of the CBP's Rio Grande Valley sector, told CNN last week that fiscal year 2018 was a "record year" for apprehensions of families crossing the US-Mexico border in the Rio Grande Valley region. "This is the highest we've ever seen before," Padilla told CNN at the Conference on Prosperity and Security in Central America in Washington. Padilla's assessment indicated that the numbers would show an all-time high for family apprehensions across the southwest border, as more than 50% of all family apprehensions took place in the Rio Grande Valley this year. Apprehensions are used as a measure of unauthorized border crossings. A spokesperson from DHS said that the department does not comment on "unofficial numbers," and a spokesperson for CBP said they are still working on their end-of-year numbers. Katie Waldman, a spokeswoman for DHS, blamed Congress in a statement for refusing "to close catch-and-release loopholes in the law that would allow authorities to detain and remove family units safely and expeditiously." "While we do not have official numbers to report at this time, current trends indicate enforcement efforts against single adults entering illegally have been hugely successful," Waldman said. "However, the removal of actual family units, or those posing as family units, has been made virtually impossible by congressional inaction -- which will most likely result in record numbers of families arriving illegally in the United States this year." CBP releases border apprehension numbers on a monthly basis. The only month for the latest fiscal year that has not been released is September. In August, 12,774 family units were apprehended at the southwest border, a nearly 40% increase over the previous month and a high for the year, according to previously released CBP numbers. Overall apprehension figures on the southwest border have already surpassed last year with 355,106 apprehensions compared to 310,531 in fiscal year 2017. However, they are not particularly high relative to last year, but lower than the year before, and right in the middle of the numbers for the past decade.